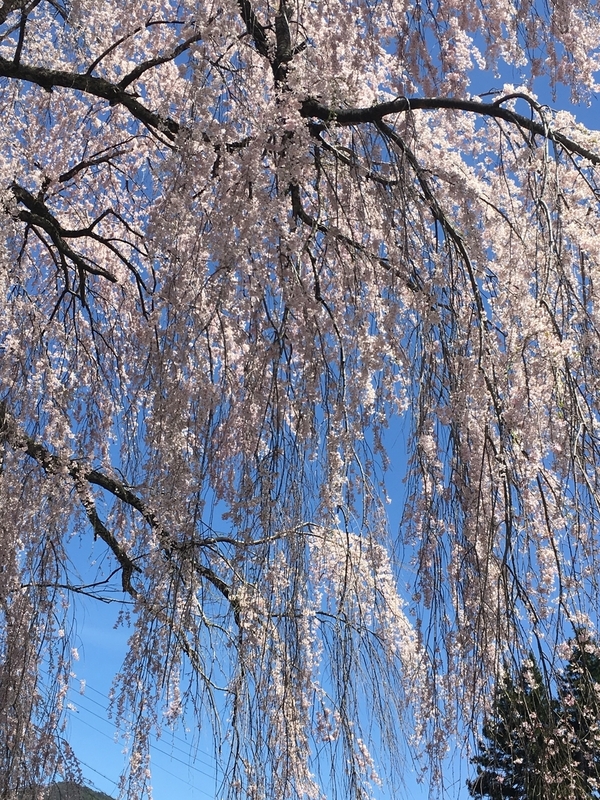 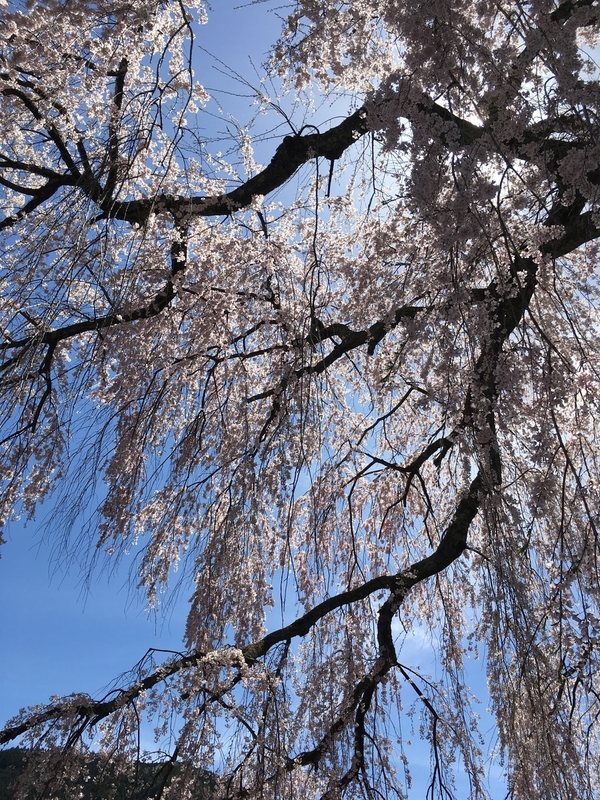 Iwataro Sakura, well known a weeping cherry in Gero. 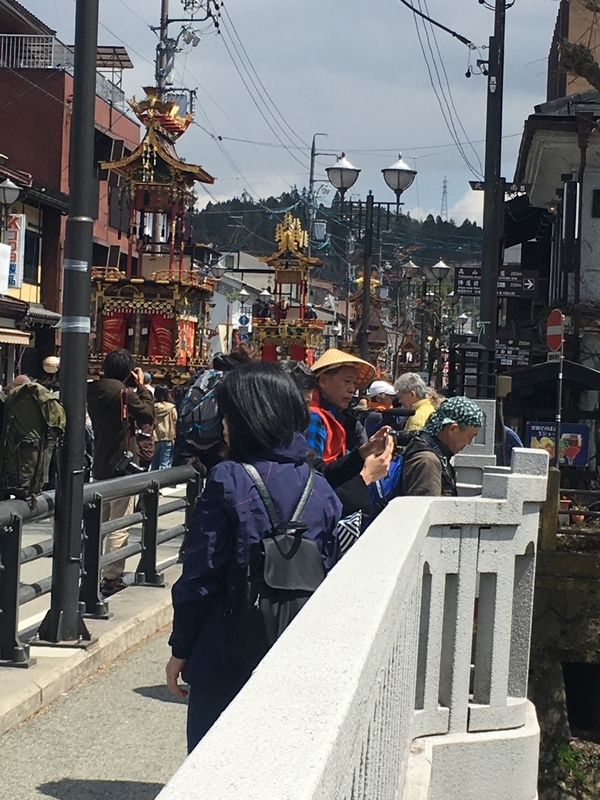 Gero is popular hot spring bath spot to the south of Takayama. 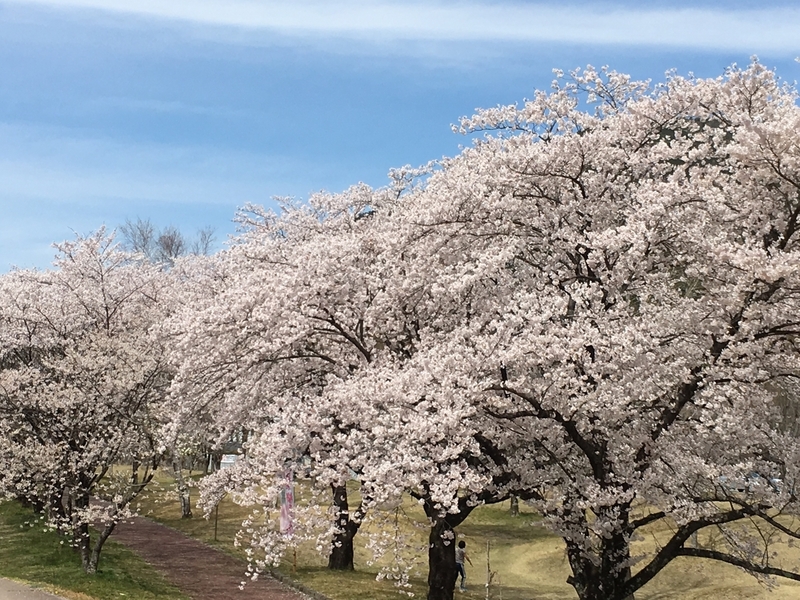 It was summer like weather and the cherry trees in this area bloomed in full. 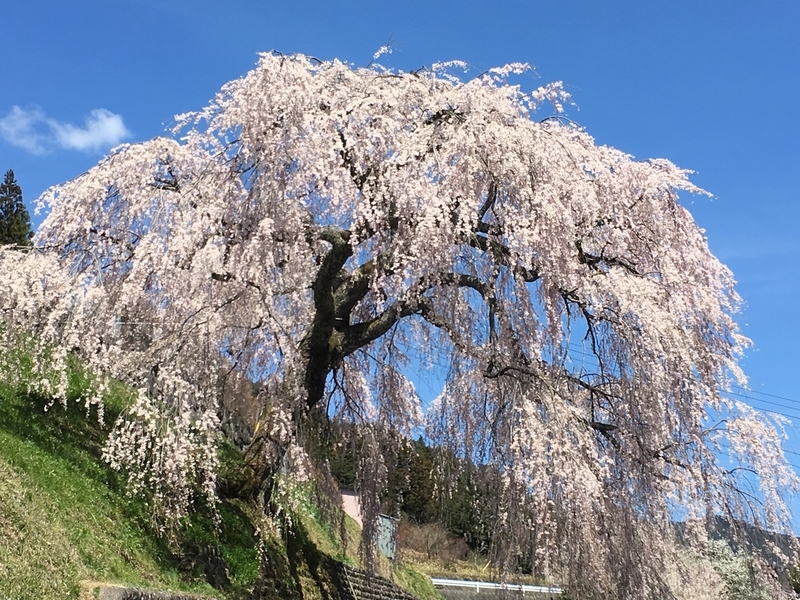 Iwataro Sakura spread its branches and made shower of blossoms. 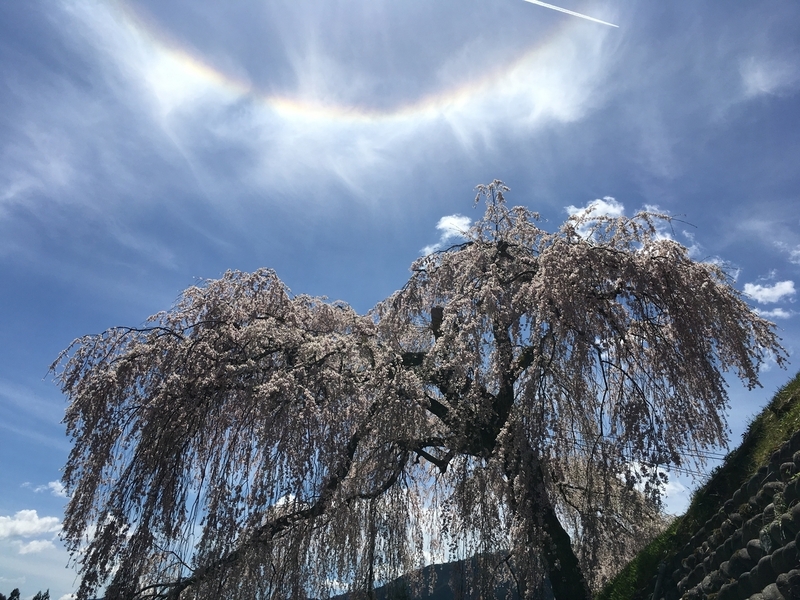 Saiun (color-rimmed cloud) appeared above the tree, feeling very lucky! 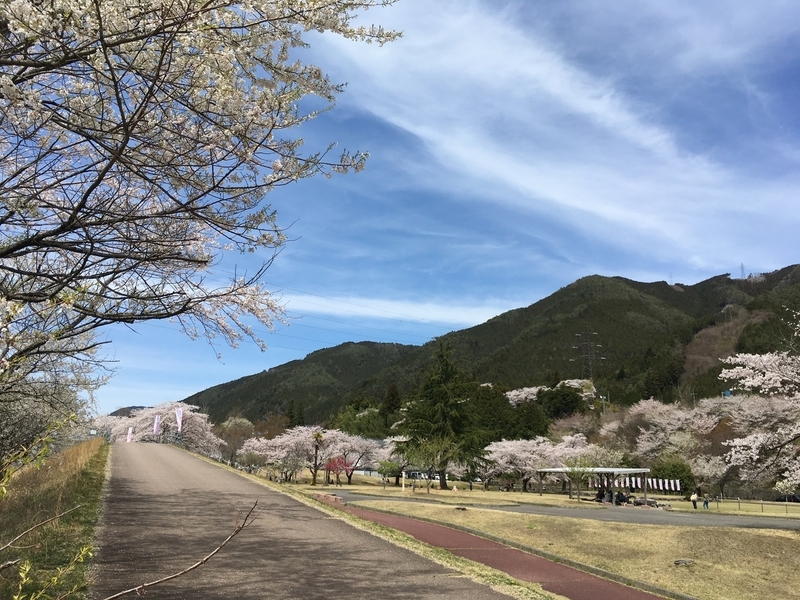 Hida riverside park was also full of cherry blossom. 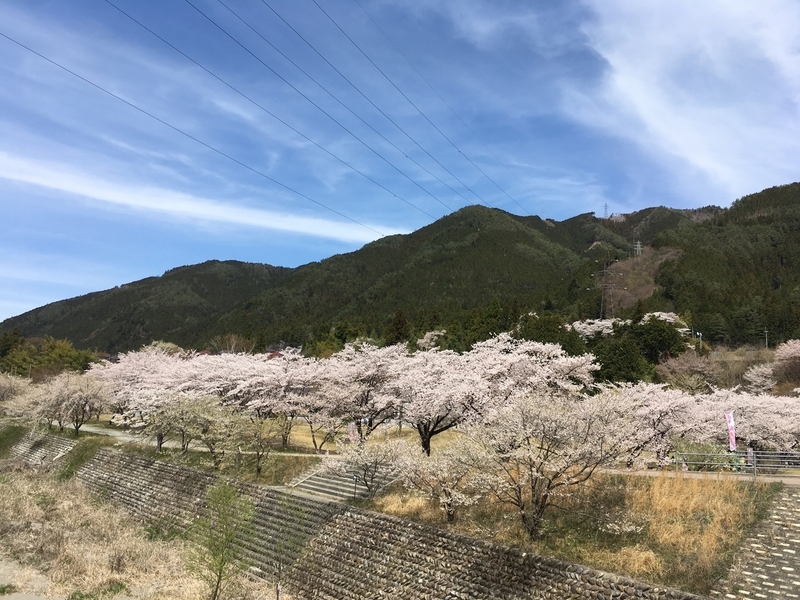 In Takayama, most cherry trees are yet to bloom. 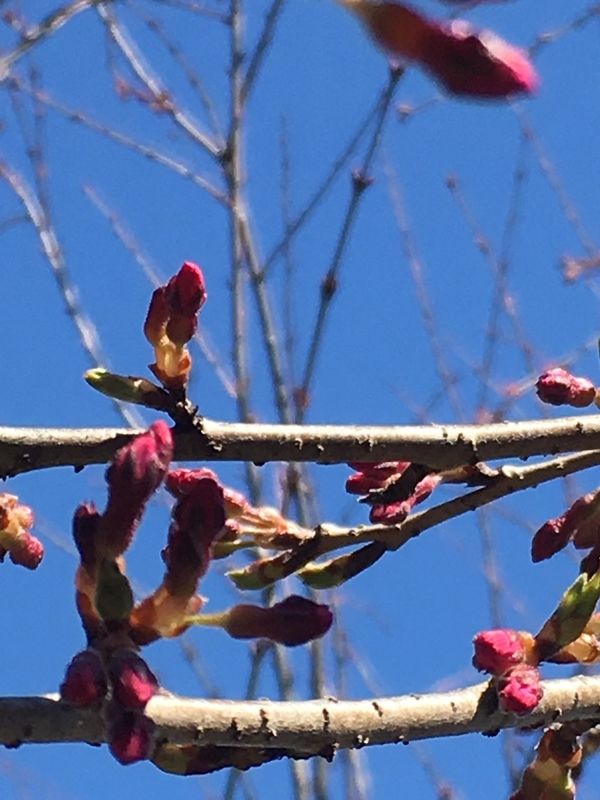 Flower buds of the weeping cherry outside of SAKANA are still tight, but will be full soon. 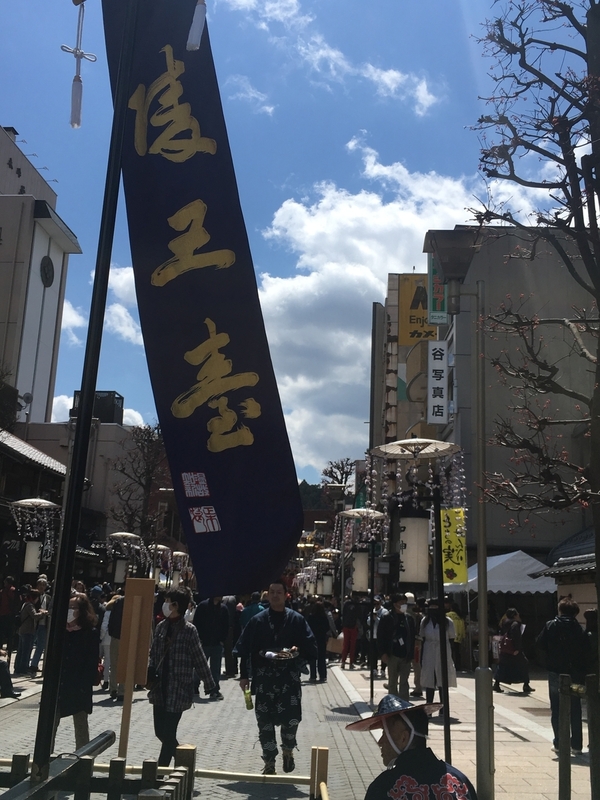 I dropped in at Takayama town centre to see the Spring festival. 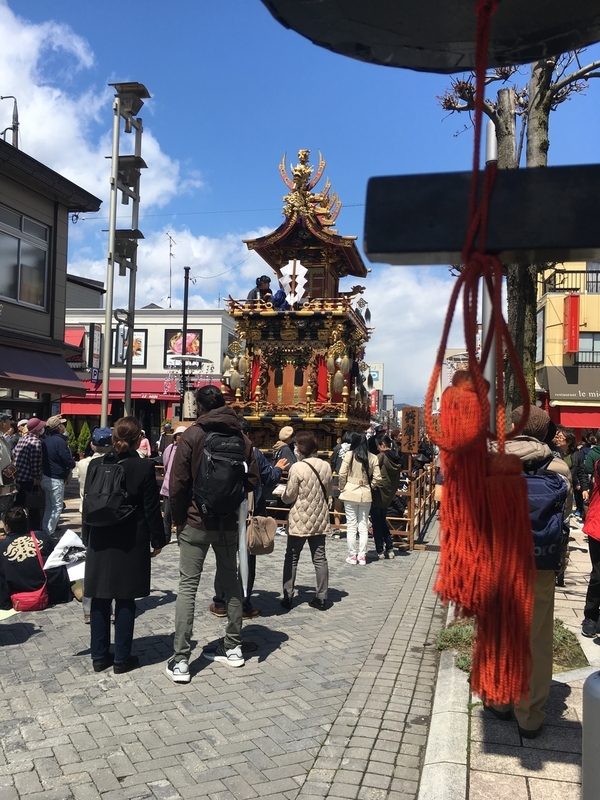 The decorated festival floats were displayed in the streets. 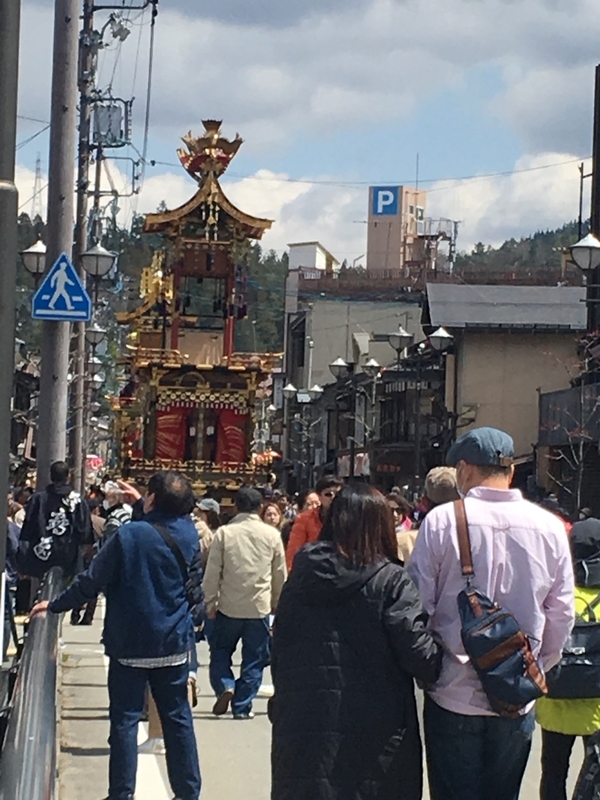 The streets were unusually crowded with the people from everywhere in the world. 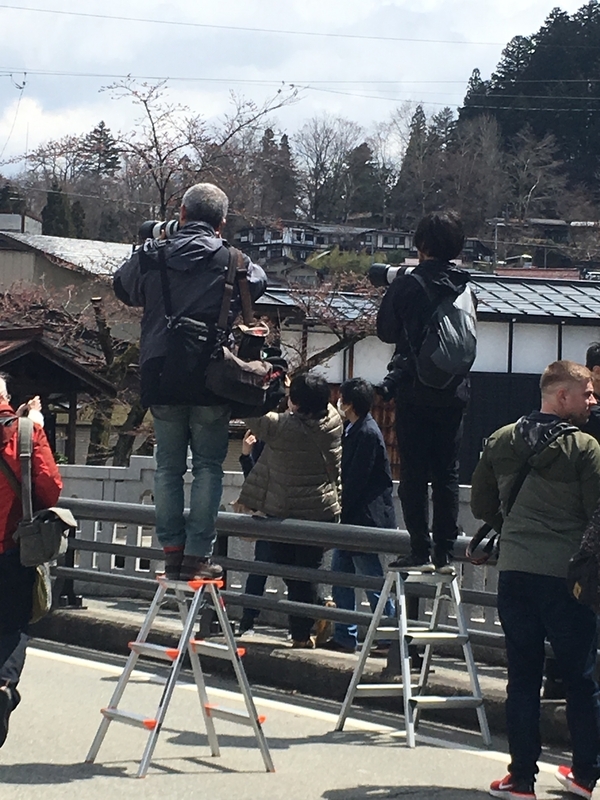 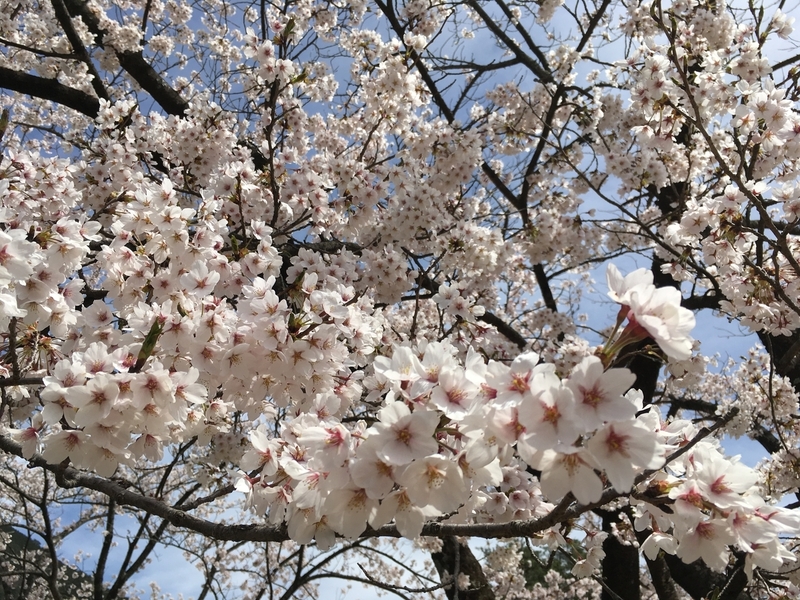 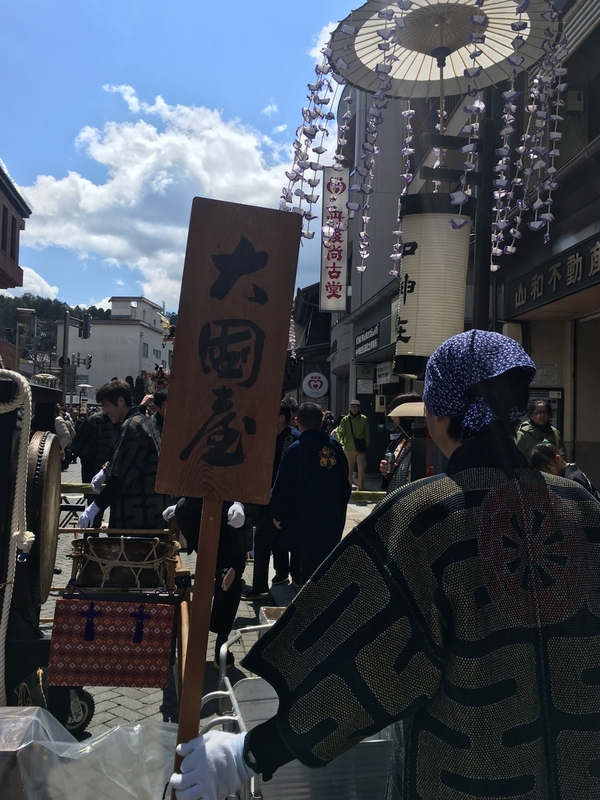 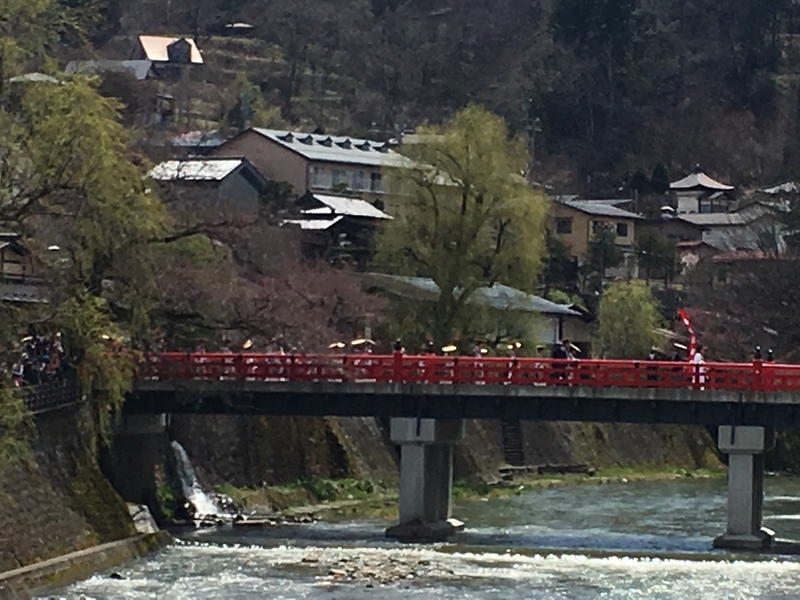 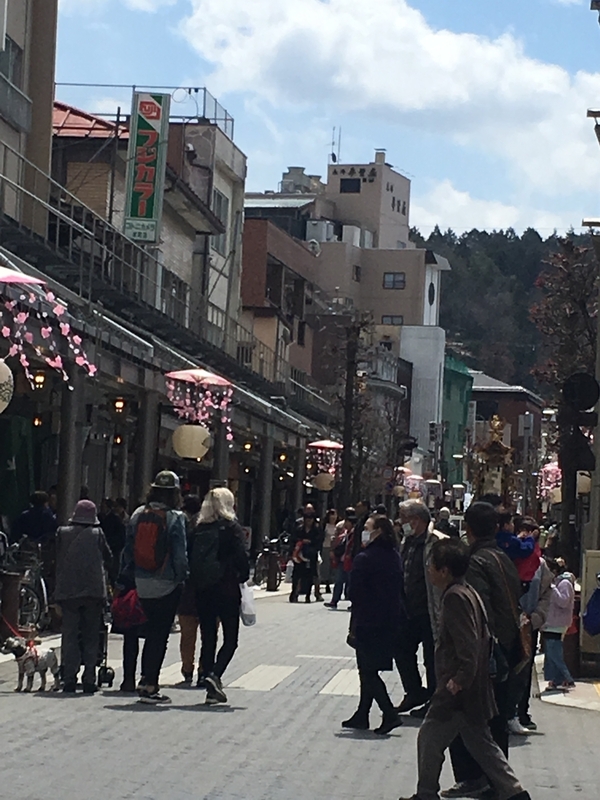 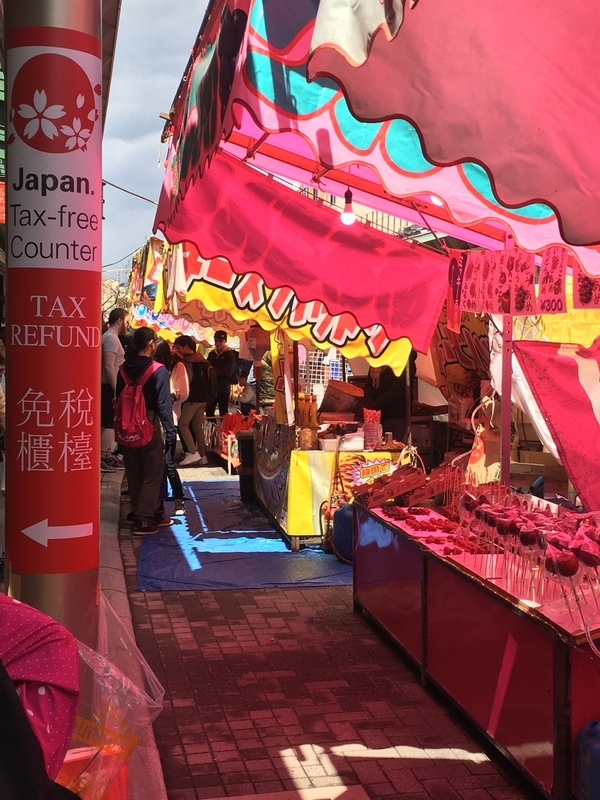 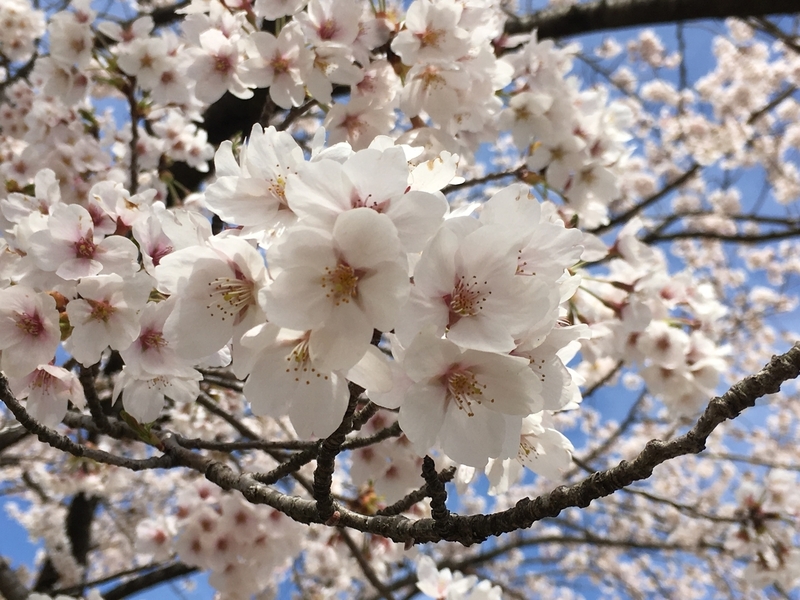 Cherry blossoms are yet to bloom in Takayama, but people enjoyed this festive mood. 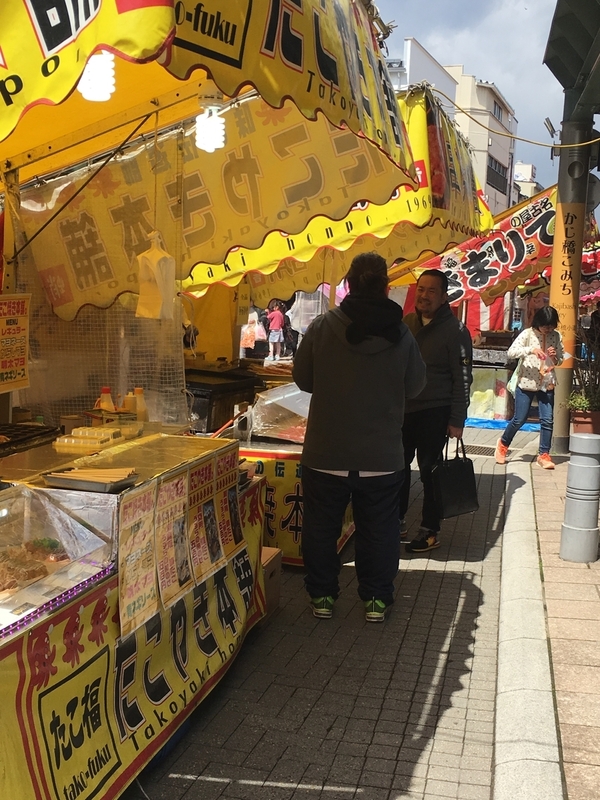 There are many food stalls too. 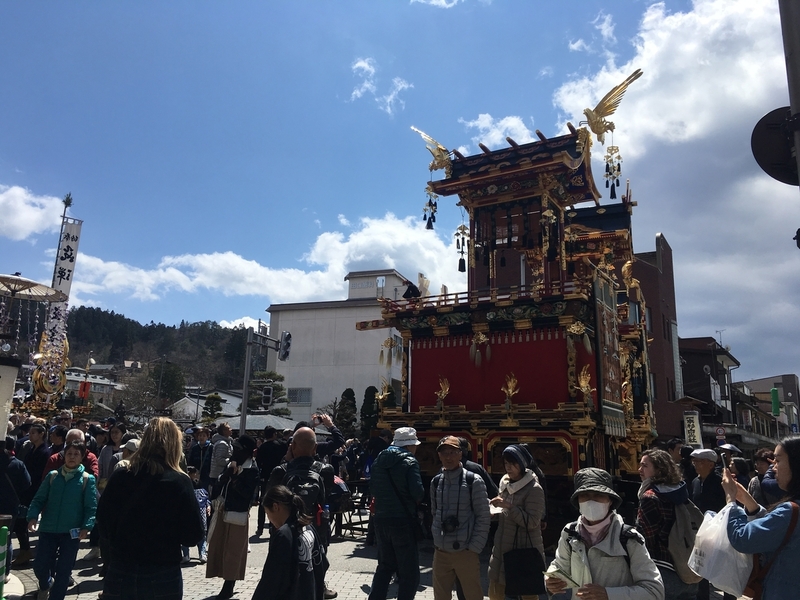 Takayama Spring Festival is held 14 & 15 April every year. 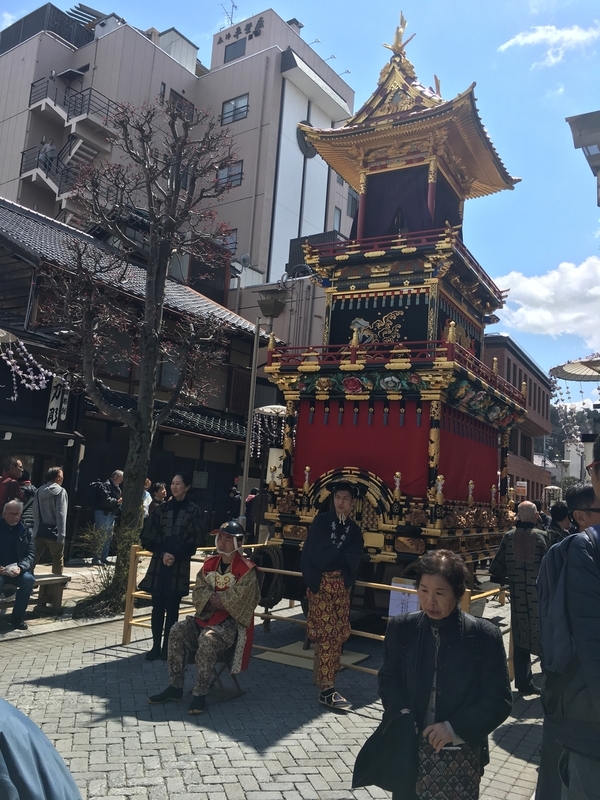 You may see karakuri ningyo performances that sophisticated mechanical dolls move and dance on the floats if you go there right time and right place. 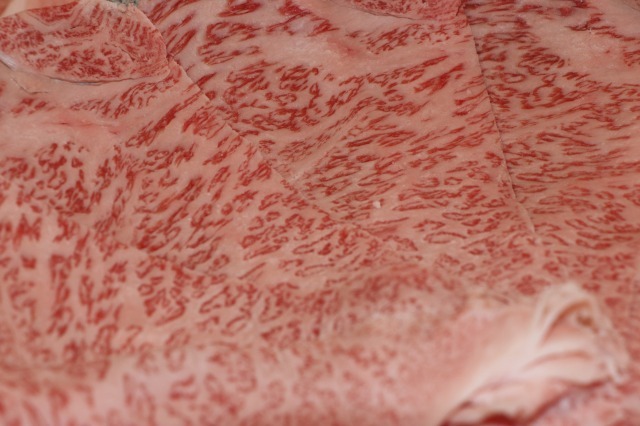 A5 grade Hida beef sliced for Sukiyaki, gorgeous marbled sirloin. 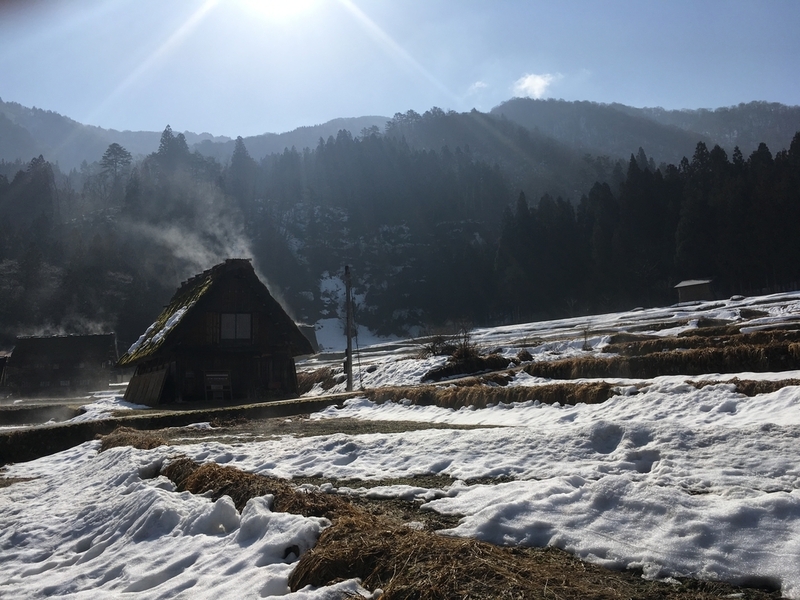 SAKANA is specialized for seasonal food, so that most of repeater visit us four time in a year, however there are transition period between each season. 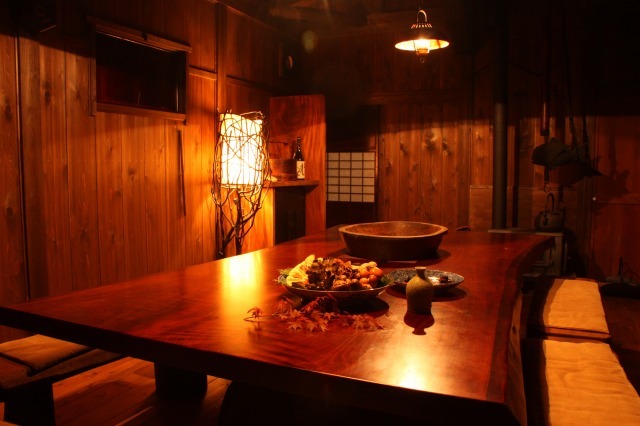 In such period, Sukiyaki and Shabu-shabu become popular menu. 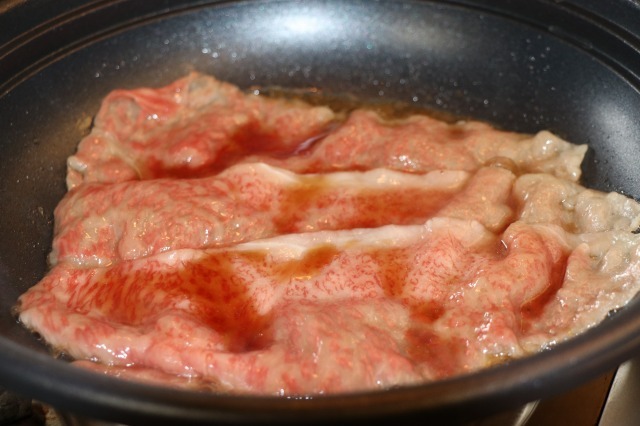 Sukiyaki seems more popular this Spring. 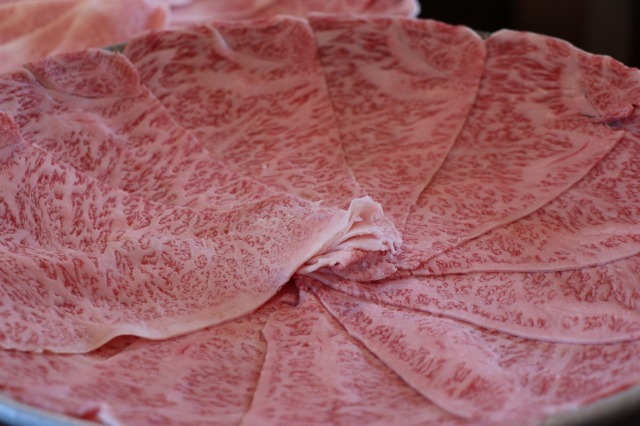 They say that the meats are sweet and delicious and will melt in their mouth. 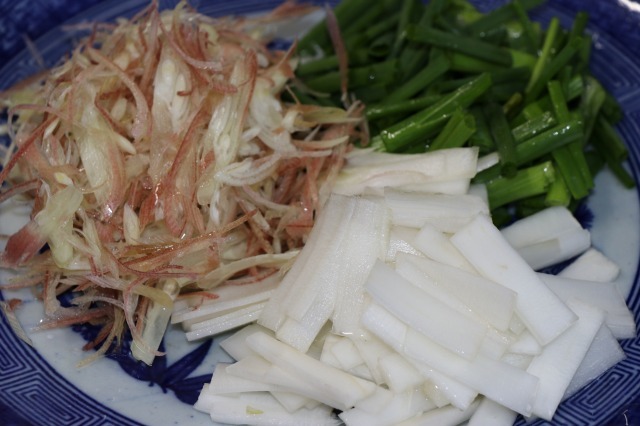 Our warishita (sauce) is very light and no row eggs (which some people think 'must have') come along unless requested by the customer. 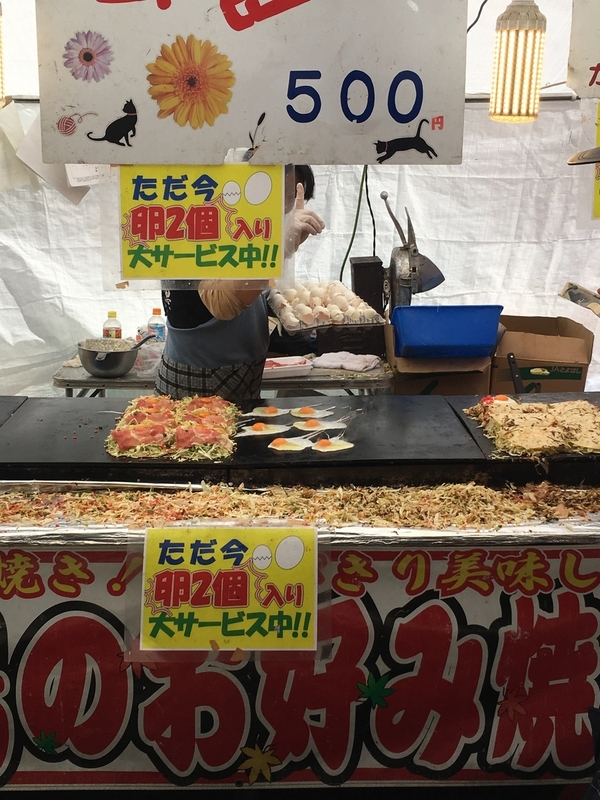 We offer this way so that the original taste of the meat will not be lost by the exess seasoning and the taste of the eggs. 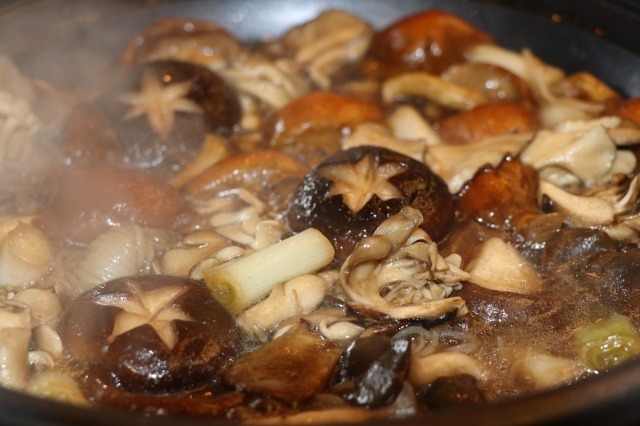 You will eat only the meat first, and then put vegetables into the sauce that have full of flavor of the beef. 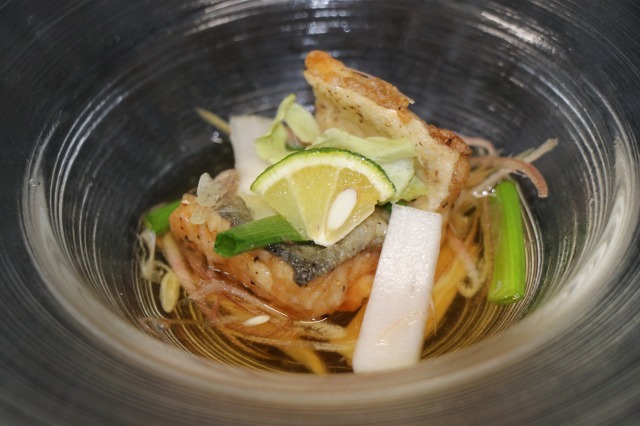 Fresh green salad, rice and miso soup come with the Sukiyaki course. 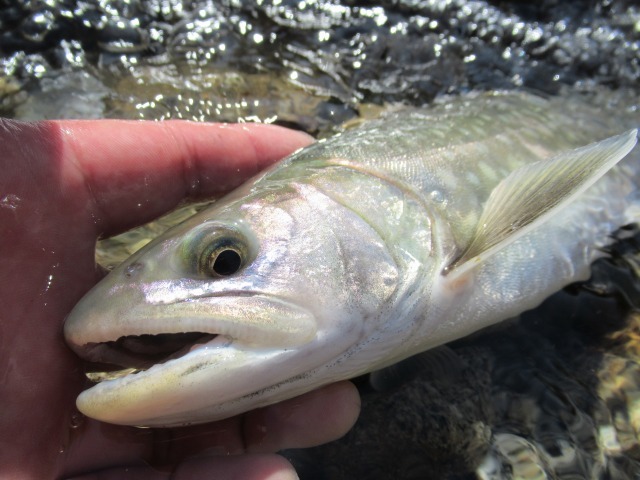 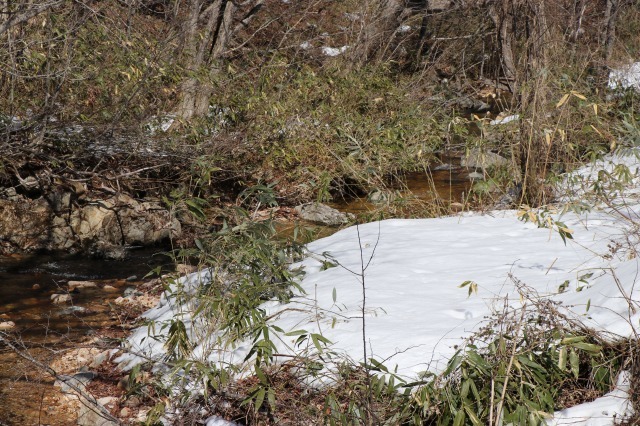 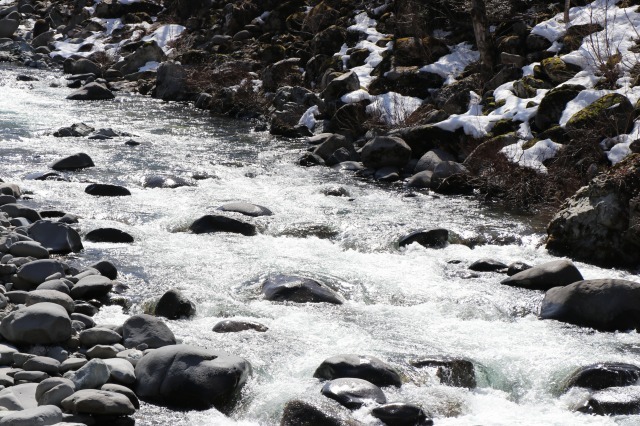 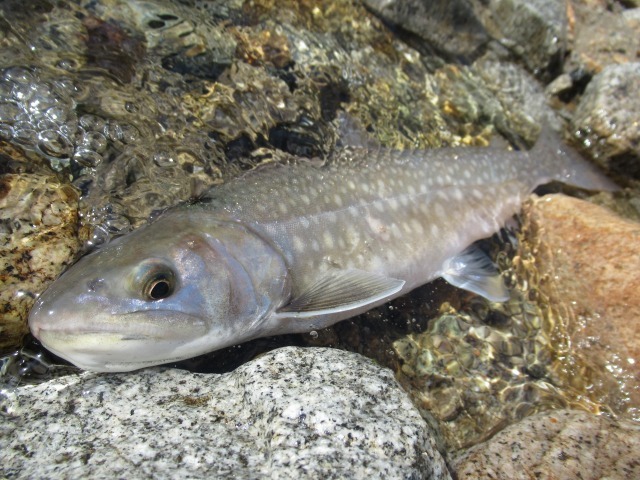 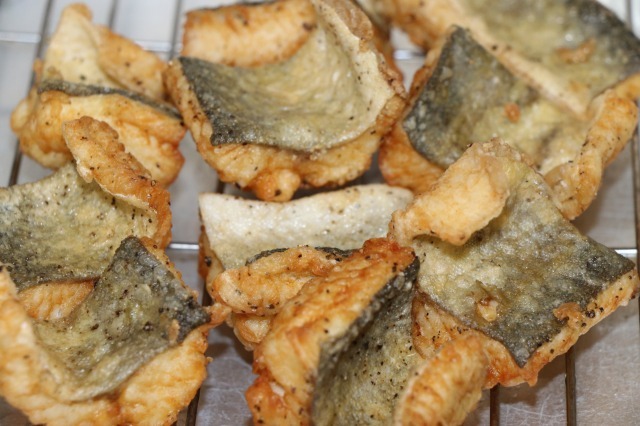 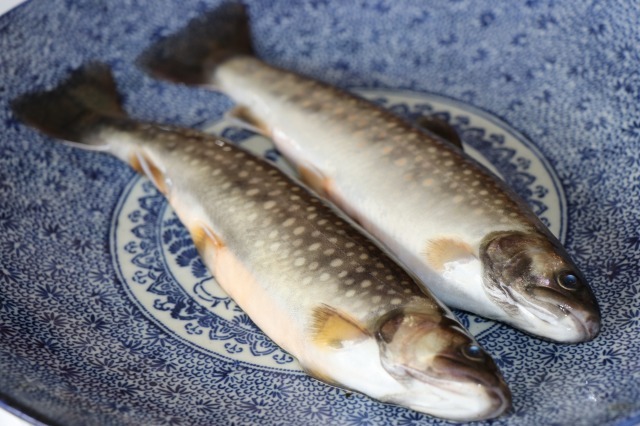 River fish have become active, fat and delicious in the water of melted snow. 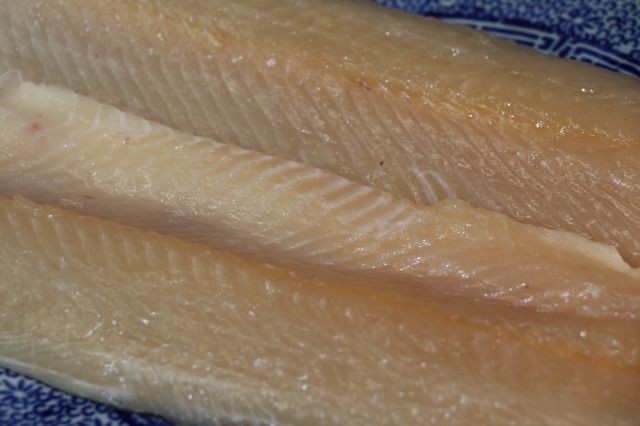 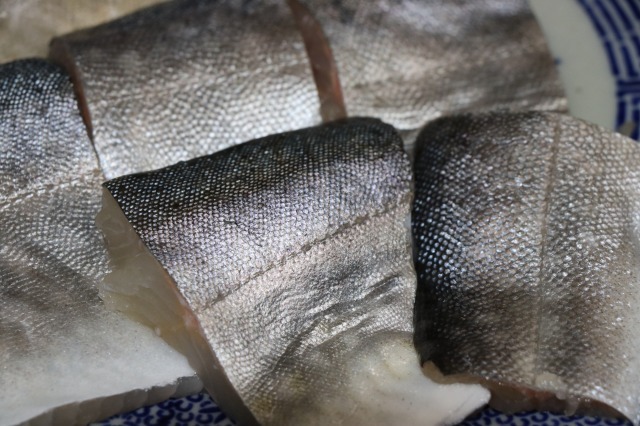 Salted grill is simply good, and also it can take good stock from charr (Iwana). 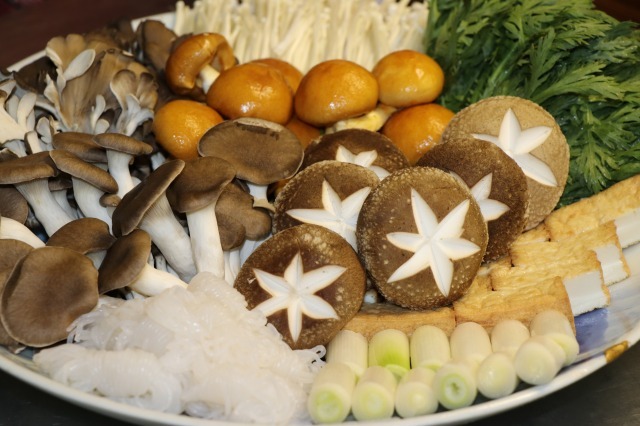 Plenty of wild vegetable and Iwana hot-pot is one of our speciality from Spring to early Summer. 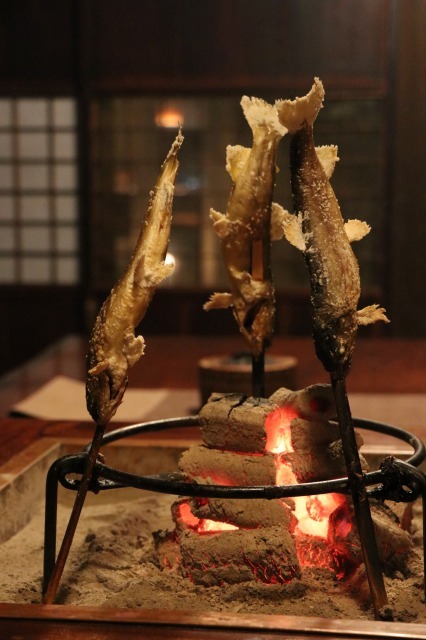 Irori course (charcoal grill at a hearth) is getting popular recently. 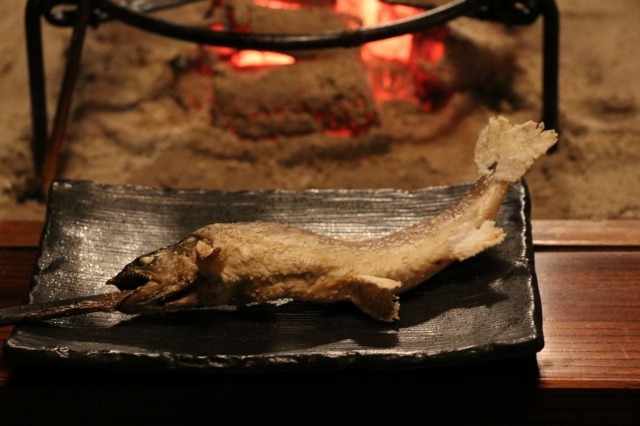 It's really fun to have a group of people sitting around a charcoal fire and eating meat and fish grilled in front of you. 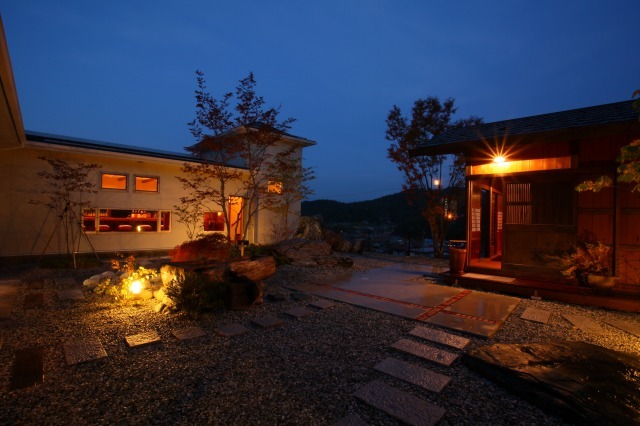 As indicated on our home-page, Irori course should be reserved for private use so as premium course,therefore it requires four to eight guests in the group. 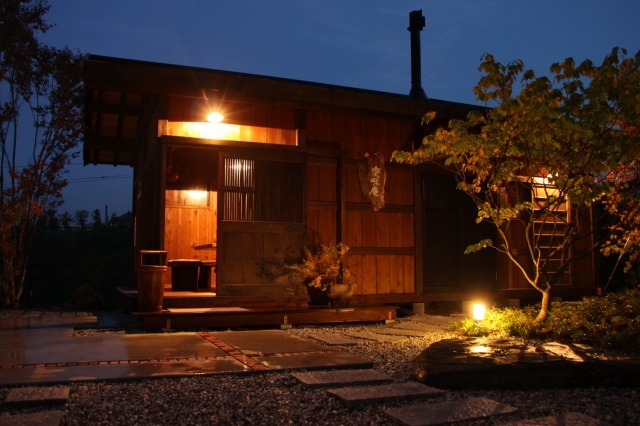 This small cottage is specially used for the Irori course or premium course. 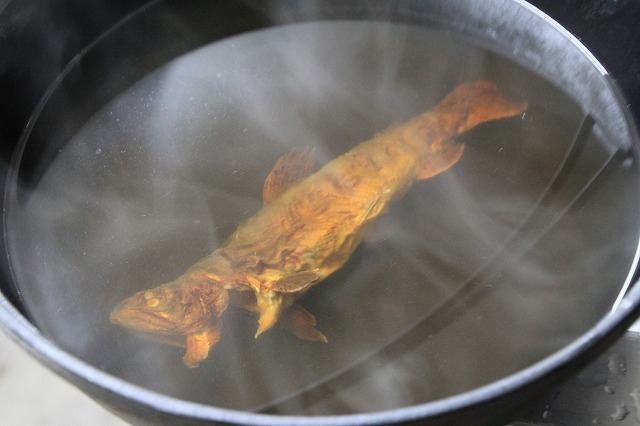 A good size of wild char has caught by the owner chef. 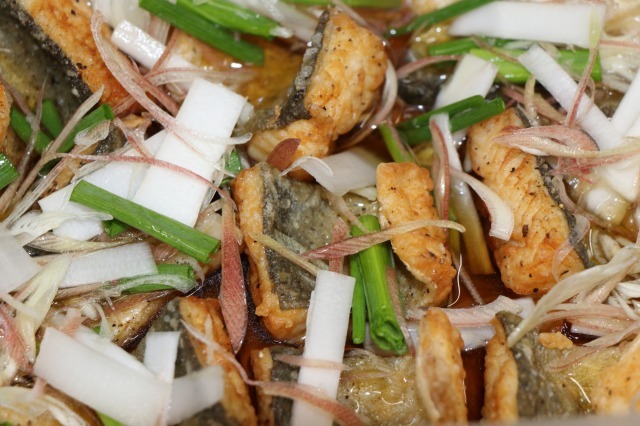 Marinade with vinegar and vegetables. 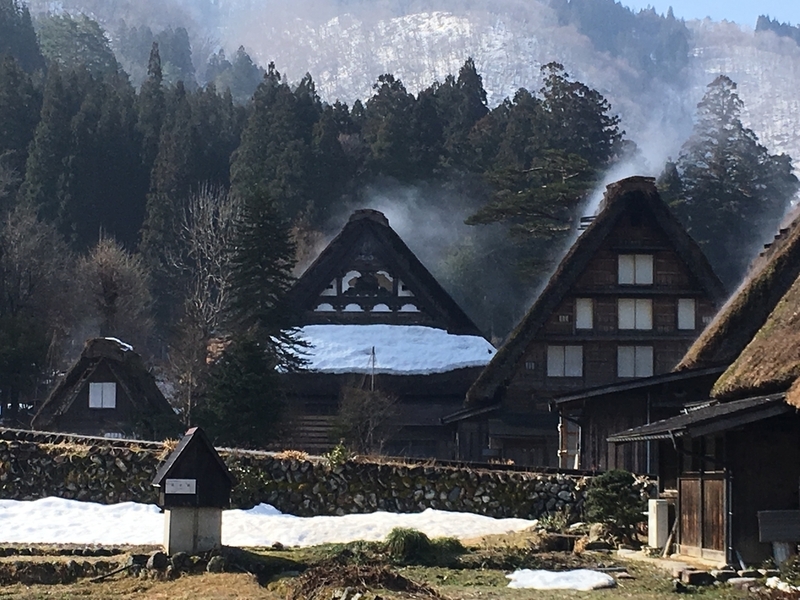 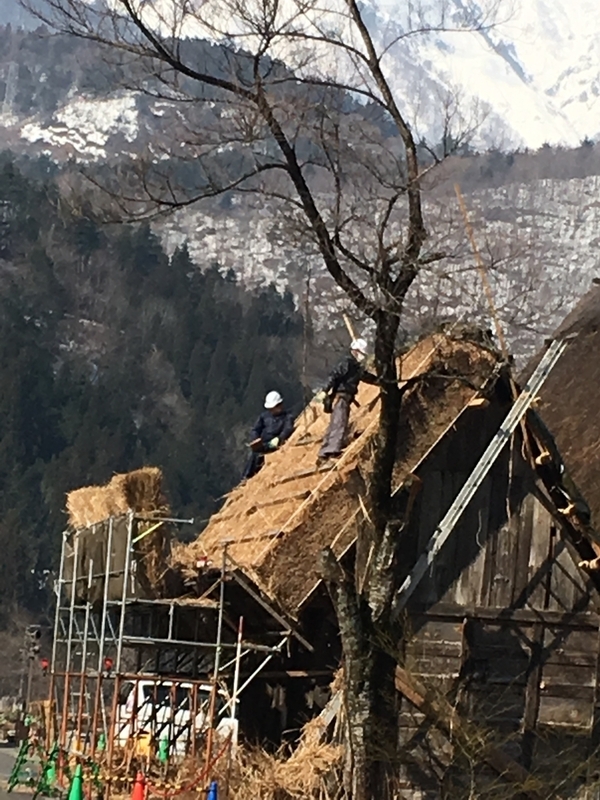 Thawing season came to Shirakawa village too early this year, tourists who were looking forward to the snow was disappointed, however the villagers welcomed the Spring. 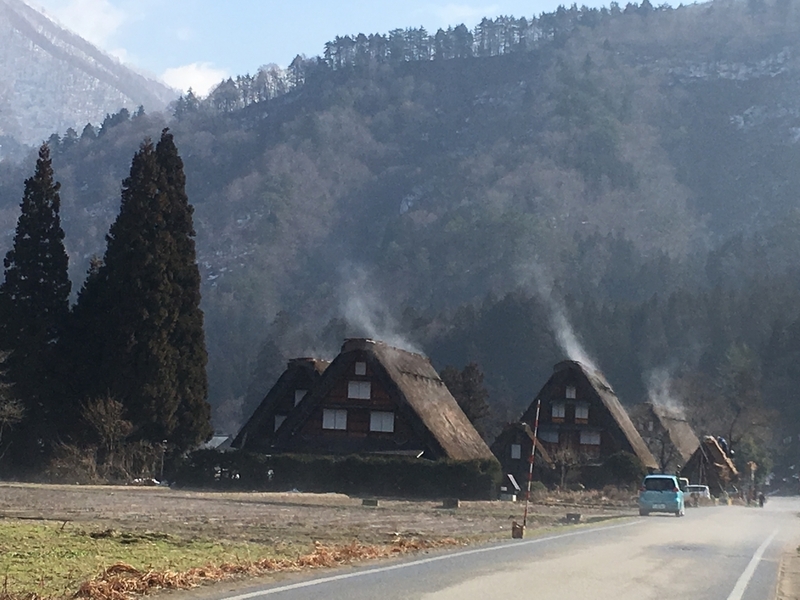 The rising smoke naturally fumes the thatched roof and exterminates insects and molds. 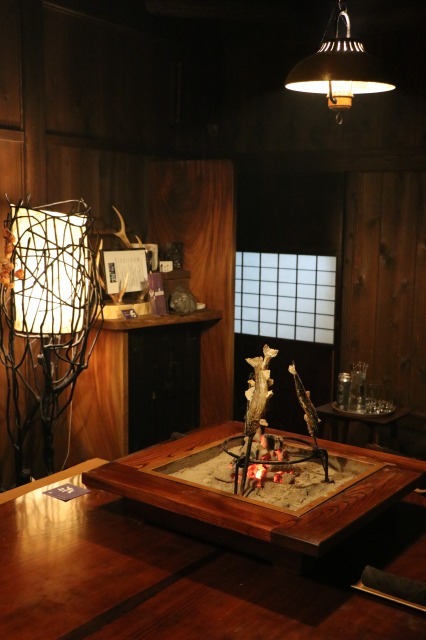 Burn firewood in the center of the room and fill it with smoke. 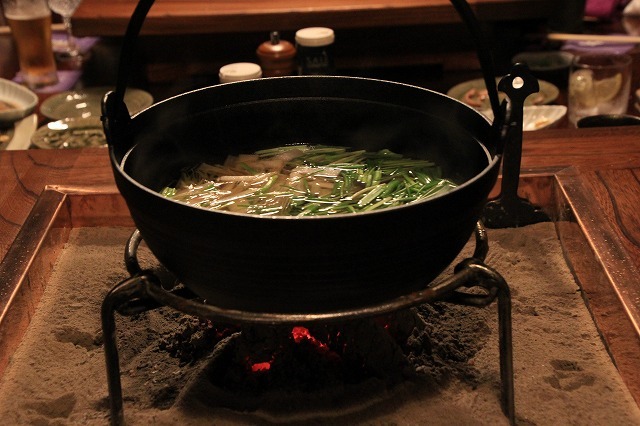 The hearths and kitchen range stove are important items for the thatched houses. 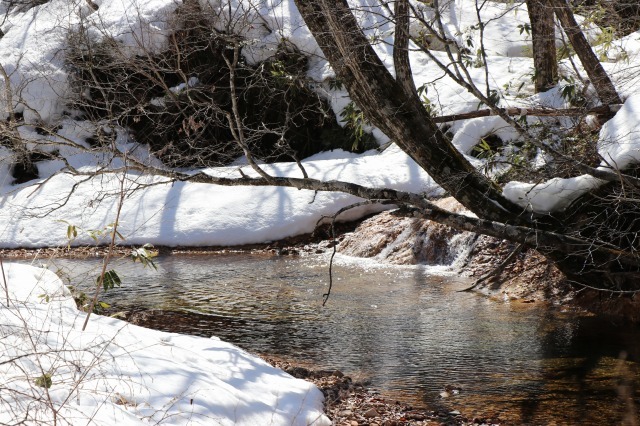 We had less snow this winter and signs of spring shows three weeks earlier than usual. 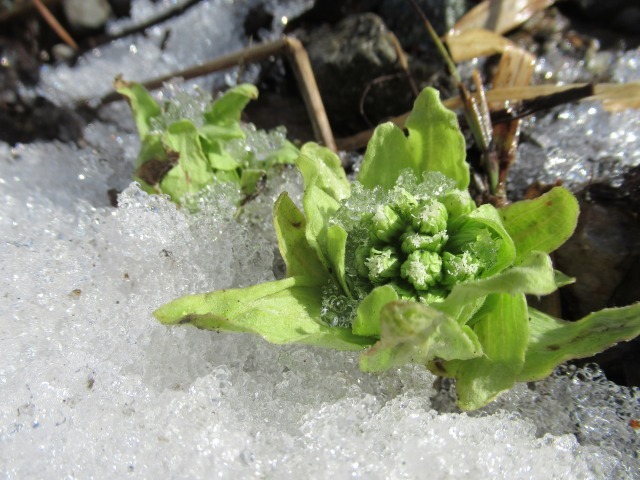 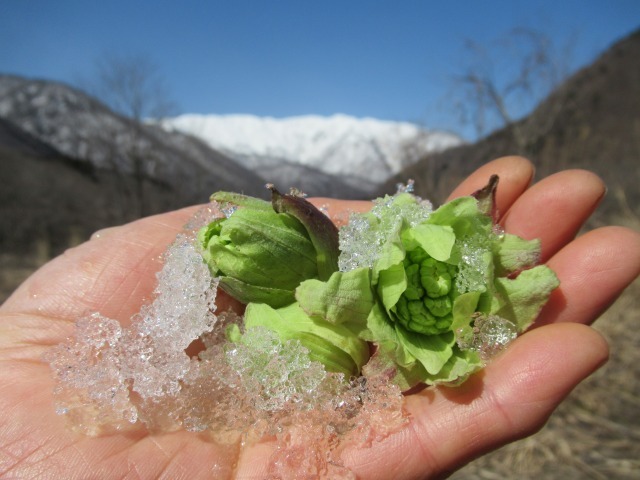 Fukinoto (butterbur buds), one of popular adible wild vegetable, were shooting out from where the snow is melting.